To report purchase problems, please fill out this form http://www.snapgardens.org/snap-purchase-problems/ and see below for more information. 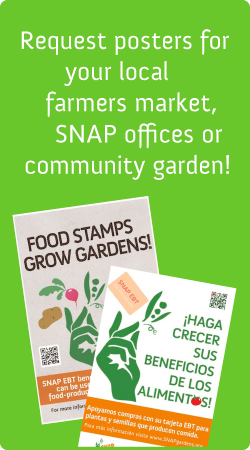 If the places where you use SNAP benefits sell food-producing plants or seeds, then you can use your benefits to purchase those items. It should be as simple as that. If your preferred retailer does not sell food-producing plants or seeds, consider asking them to place a special order. If you have a seed or plant catalog, bring it to the retailer, and show them exactly what you’d like them to order for you. Gardening soil, fertilizer, peat moss, and other gardening supplies are NOT eligible items. If you are buying both SNAP eligible and non-eligible items (such as shampoo, toilet paper or alcoholic beverages) during the same shopping trip, make sure you check your receipt to be sure your plant and/or seed purchases were classified as SNAP eligible. 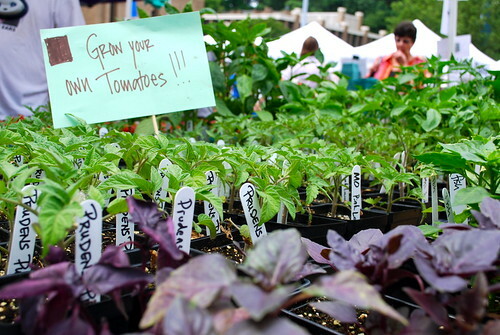 If you live in public housing, ask management if there might be space to garden. Contact your municipal Parks Department to find out if there’s any public land that can be gardened. Your local public library also likely has some good gardening books to lend. Share your ideas and experiences with us! Have other ideas or resources? Please share with us at ideas@SNAPgardens.org or fill out our comment form! Do you use your some of your SNAP benefits to buy plants and seeds? Please take our survey. SNAP-Ed and Gardening: More Gardening Opportunities in FY 2013 SNAP-Ed Guidance!